Pensacola State College Institutional Research analyst Eugenio Hernandez and Director of Institutional Research Michael Johnston recently received recognition from the National Student Clearinghouse (NSC) for publishing their step-by-step guide, “It’s Element-ary: Perfecting StudentTracker Data Elements,” on the Association of Institutional Research (AIR) website. StudentTracker enables participating institutions to perform educational research and analysis utilizing enrollment and graduation data from more than 3,600 colleges and universities, who enroll 98 percent of all students in public and private U.S. institutions. 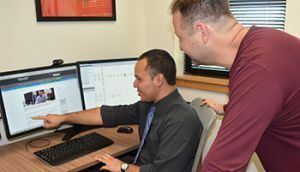 The guide developed by Hernandez and Johnston provides technical tips to users who enter data, making the program easier to use. The AIR supports higher education professionals in the collection, analysis, interpretation and communication of data, and the strategic use of information for effective decision-making and planning. The association provides resources, innovative practices, and professional development opportunities for members and the higher education community, including professionals from institutional research, effectiveness, assessment, planning and related fields.